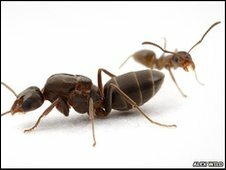 Desert ants in Tunisia smell in stereo, sensing odours from two different directions at the same time. By sniffing the air with each antenna, the ants form a mental 'odour map' of their surroundings. They then use this map to find their way home, say scientists who report the discovery in the journal Animal Behaviour. Pigeons, rats and even people may also smell in stereo, but ants are the first animal known to use it for navigation. Dr Markus Knaden and colleagues Dr Kathrin Steck and Professor Bill Hansson of the Max-Planck Institute for Chemical Ecology in Jena, Germany investigated how the desert ant Cataglyphis fortis navigates around its surroundings. Each day, individual ants will leave the nest entrance and travel up to 100m in search of food. When they find some, they return straight home, somehow finding their tiny nest entrance again within a bleak, relatively featureless desert landscape. Scientists knew the ant uses a sophisticated array of visual cues to find much of its way home. But Knaden's team has now found that the insect does much more than that. First, they placed four odours marked A, B, C and D around a barely visible nest entrance. 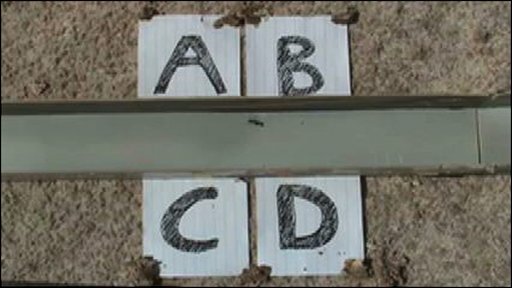 They then tested the ants by removing and placing them in a remote location, without a nest entrance but with the same four odours. The ants immediately headed to exactly where their nest should have been, confirming that they use the odours as olfactory landmarks. When the odours were mixed up, the ants became confused and unable to navigate their way home. "They had learned the olfactory scenery," Dr Knaden told the BBC. 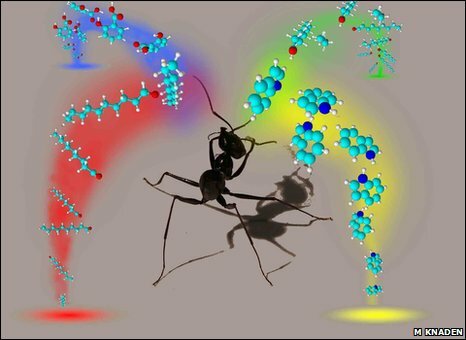 Ants with one antenna were also unable to navigate using more than one smell, confirming that the insects required two antennae, and an ability to smell in stereo, to find their way around. Other animals both navigate using smell, homing in on a single odour, and may smell in stereo. In 2006 for example, rats were found to smell in stereo, being able to locate the direction of a food source with a single sniff. Many scientists suspect that pigeons also use smells to find their way home. But until now, none have been found to do both, using a stereo sense of smell to create an odour map of the surrounding world. "I more and more get the feeling that whatever task these ants have to solve, they succeed," says Dr Knaden. "The hostile desert seems to demand a navigation strategy combining every possible navigational cue."